Home / Feature Slider / “Rogue One: A Star Wars Story” — our (completely) spoiler-free review. Blah, blah, blah. The alt+right hates the new Star Wars spinoff and stand-alone movie, Rogue One: A Star Wars Story. Because how DARE the hero be female and how dare the creators and writers ‘politicise’ the film. The lead character, Jyn Erso (Felicity Jones), leads a group of multi-cultural rebels. How. Dare. They. Not. All. Be. White. #DumpStarWars trended last month, with some aligning themselves with the Empire and the Dark Side, rather than be “with her” [Jyn]. Fair enough screenwriter (and anti-Trumper) Chris Weitz tweeted that the Empire was a “white supremacist (human) organization”, and later deleted the tweet and apologised for “connecting an innocent escape to ugly politics”. But, aside from the usual good vs bad and anti-authoritarian story line characteristic of the franchise, Rogue One is hardly the propaganda the white supremacists would have us believe. 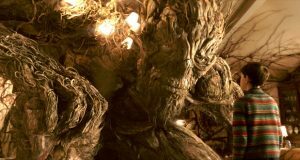 Despite the hatred, director Gareth Edwards (Monsters, Godzilla) gives fans of the Galaxy Far, Far Away, a fresh and entertaining new story that brushes against the familiar Star Wars arcs, but only barely so. Unlike The Force Awakens, Rogue One relies less on nostalgia and more on strong story-telling and multi-dimensional characters. Darth Vader is the most prominent crossover, but he’s not even the main villain. And the iconic opening theme tune is adapted – still an adventurous orchestral piece, but with a different melody. In Rogue One, former Empire military scientist, Galen Erso (Mads Mikkelson), is approached by his ex-employers to help them create a weapon like no other. Galen wants to stick with his new career in farming, but the Empire is great at blackmail and to protect his family Galen concedes. Galen’s young daughter, Jyn, escapes, but her mother is killed. Jyn is rescued by an anarchic rebel leader, Saw Gerrera (Forest Whitaker), who takes her under his wing. Fast forward some years and Jyn is a prisoner with a lovely rap sheet. While she’s being transported to a labour camp, soldiers of the Alliance help free her, seeking her help. They want her to visit Saw and use him to get in touch with her father, so they can find out more information about the weapon. In exchange, they’ll make sure she goes free for good. Along with Rebel captain Cassian Andor (Diego Luna) and his reprogrammed Empire droid – the delightfully sarcastic and acid-humour K-2SO (Alan Tudyk) – Jyn begins her reluctant hero’s quest, to stop Empire Commander Orson Krennic (Ben Mendelsohn) from orchestrating an apocalypse. 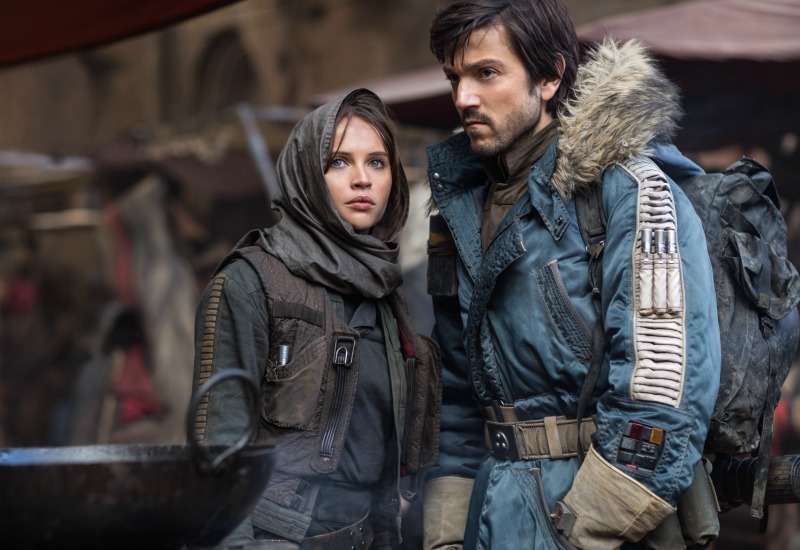 Felicity Jones as Jyn and Diego Luna as Cassian in Rogue One: A Star Wars Story. Part of what makes Rogue One feel so different to other Star Wars films, is the breath-taking new worlds – strange planets and moons and ships that feel only vaguely familiar. The action is dazzling. But mostly, what differentiates Rogue One is that this film is much darker, much grittier than any of its space opera predecessors, and Edwards does this well. For the first time, the intergalactic War is actually war-like. (Imagine Steven Spielberg had a chance to do the death and destruction.) The plot doesn’t hurtle towards an obviously pleasant end. Felicity Jones seemed a strange choice (to me) to play Jyn, coming off her Oscar nomination for the tearjerker bio-drama of Stephen Hawking, The Theory of Everything, in 2015. Then again, she has to redeem herself from the complete abomination that is the current Dan Brown-adaptation, Inferno. But Jones gives Jyn a kickass finesse, as she’s forced to abandon a colourful past for a (fairly) Campellian quest. 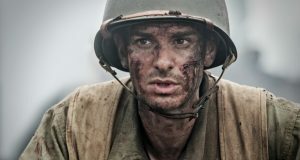 The throwbacks from the cameos will assuage die-hard fans who want some familiarity to ground the story, though the film is all the more exhilarating for its newness. Rogue One provides a fitting end to the 2016 year in Hollywood films (or, at least, the near-end). It’s an action, sci-fi adventure that is both escapist and thoughtful for this kind of genre, fun and funny. 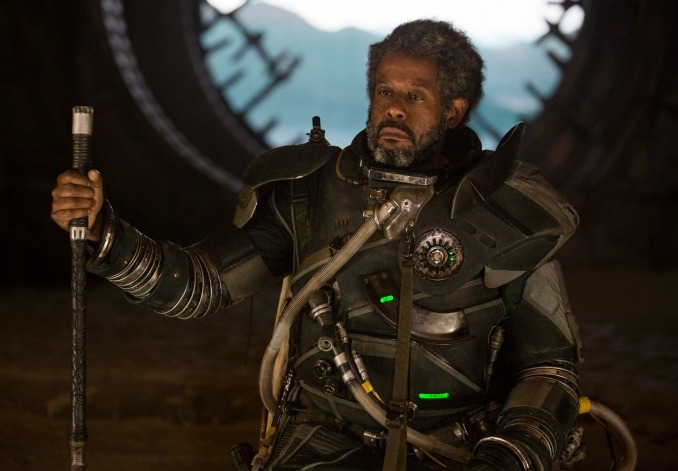 Forest Whitaker as Saw Gerrera. Previous: “La La Land”, “Moonlight” lead Golden Globe nominations. 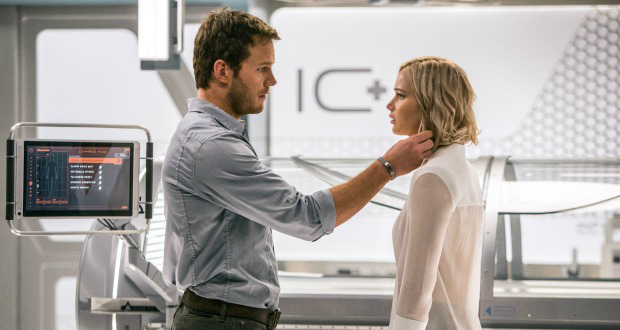 Next: “Passengers” — a cosmic love story.